A letter has been sent out to all of humanity, warning us of an impending calamity. The letter, which has been signed by over 15,000 scientists, was published in November 2017. Aptly named the “World Scientists’ Warning to Humanity,” the letter voices scientists’ growing concern with climate change and calls for humanity’s participation in curtailing environmental destruction. 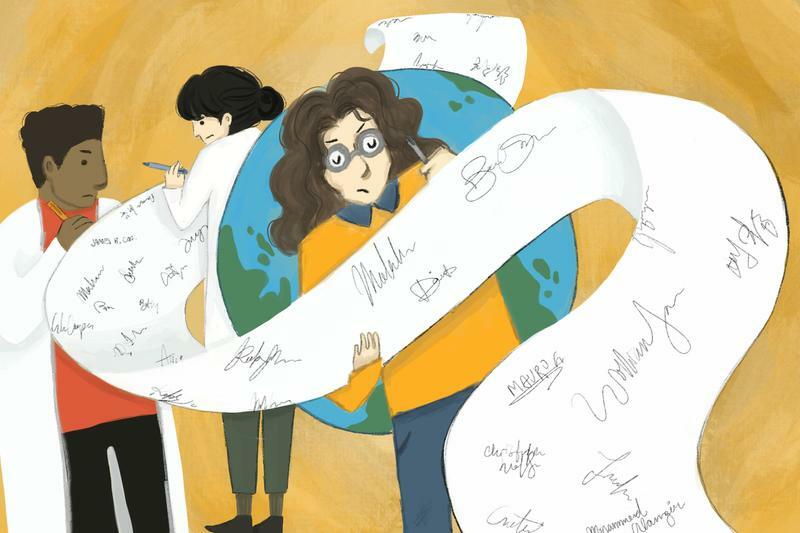 Of the signatures, there are at least 527 from Canada, and at least 60 from researchers or affiliates of UBC. This is not the first warning that has been sent to humanity. A similar letter, the scientists’ first notice to humanity, was sent 26 years ago in 1992, also calling for humanity to take action against climate change by reducing environmental destruction and creating changes to avoid an environmental crisis for humanity. The 2017 letter calls for similar action while examining climate change data over time, particularly during the decades that have elapsed between the first letter and the second. The 2017 letter evaluates various global trends related to climate change, many of which have worsened over the past 26 years. Since 1992, the global human population has increased by 35 per cent, putting pressure on the planet to support two billion more people. Additional trends include declining vertebrate species, increasing temperature change, decreasing freshwater availability and increasing carbon dioxide emissions. By contrast, the depletion of the ozone layer — the atmospheric layer that inhibits the earth from heating up too quickly — has slowed and is expected to greatly recover by the middle of the century. The scientists also argued that climate change has unleashed a mass extinction event that will eliminate many life forms or set them on the path to extinction by the end of the century. Canada is no exception to the impacts of a changing climate. Letter signatory Dr. Greg Henry, a UBC researcher who studies the effects of climate change on the Arctic and northern populations, described the remarkable changes he has observed in the Canadian Arctic over time. When he started his PhD in the 1980s, it had already been predicted that the climate was likely going to change, but the research was in a fledgling stage at that time. Henry described a variety of changes in the Arctic he had observed due to climate change and how they have impacted ecosystems and people. For example, the thawing of the Arctic permafrost — permanently frozen ground — can lead to thermokarsting, where tundras experience increased ponding and consequently higher levels of freshwater. These changes also include increased shrubbery north of the treeline, changing animal populations and increased winter snowfall and summer rainfall in certain areas of the Arctic. Changes that occur, Henry noted, are not uniform and different parts of the biome respond in different ways to the changing climate. He also described how the Inuit and other northern populations, who have lived in the Arctic for generations, are finding it increasingly difficult to predict the way the system will react to changes in climate. Canada is home to a wealth of natural resources. It has the third largest renewable freshwater supply worldwide and nine per cent of the world’s forest cover. The changing climate has resulted in various consequences across the country, including melting ice caps in the Arctic, increased ocean acidity and lengthened growing seasons in many regions. In BC specifically, there are a number of ongoing and projected changes influenced by the changing climate. Milder winters and warmer summers contribute to the infestation of mountain pine beetles which devastates BC’s forests. The largest sea level rises in coastal BC that are influenced by climate change are expected to occur around the Fraser Lowland, southern Vancouver Island and BC’s north coast. Henry also explained that the loss of water reservoirs due to melting glaciers and icecaps in the mountains will affect BC and Alberta in particular. Even though climate change has far-reaching consequences, its effects can be extremely difficult to track. Describing her own research with food webs and the insect communities that live in bromeliads, Amundrud explained how changes in an ecosystem can affect other aspects of the same ecosystem. She found that predators in the ecosystem are actually disproportionately affected by decreased precipitation, a predicted outcome of climate change in the tropics. This decreases the number of predators, which can then increases the number of prey and subsequently influences the amount of resources available and the food supply. The end result is an ecosystem structure that is completely different from the original ecosystem. Similarly, the predicted impacts of climate change are expected to affect multiple aspects of human society such as environmental systems, the economy and human health. The impact of increased levels of greenhouse gases — which are a key factor in climate change and are the byproduct of many human activities — are expected to lead to increased average annual temperatures, higher risks of flooding and overall increased precipitation levels across most of the country. Canadians may also experience an increased risk of respiratory and cardiovascular problems due to higher temperatures and increased air pollution. Agriculture, forestry and tourism are among some of the industries that may be affected by changing weather patterns, while the exacerbation of human health impacts is expected to put pressure on the healthcare system. The letter calls for changes such as preserving wildlife reserves, reducing food waste through better infrastructure and rewilding areas with native species. In 2015, Canada signed the Paris Agreement, an agreement within the United Nations Framework Convention on Climate Change to curb greenhouse gas emissions to prevent the planet from warming up more than two degrees Celsius.